Stencil art in the Kimberley region is restricted to the earliest and most recent art periods, appearing not to have been practised during the lengthy intervening times. The IIA Period art contains remarkable stencil art compositions, frequently lowest in the layers of superimposition, which are probably some of the earliest surviving forms of painted art in the region. Some indication of minimum age of the early stencils may be gained by the hand stencil superimposed by a Bradshaw painting, the latter having an identified minimum age of 17,000 years. This was determined by optically stimulated luminescence (OSL) dating on an overlying wasp nest. The fact that the underlying IIA Period hand stencil must in turn be of greater age than the Bradshaw. Hands are the dominant theme in stencil applications during both the IIA Period and the later Wanjina Period, with large adult hands by far the most common. The differences in the dimensions of adult hand stencils between the early and late art periods are marked. Digits are frequently noticeably much more rounded and ‘stockier’ at the tips, appearing much ‘heavier’ than the frequently elegant and tapering fingers evident in recent Wanjina Period stencils. Many Wanjina Period stencils could be considered beautiful, with their tapering, fine form, as in fact are many hands of contemporary Aborigines. It is not uncommon to see IIA Period hand stencils with finger spans of up to 230mm, outer index finger length of up to 125mm, finger widths to 25mm and thumbs to 30mm. These suggest very large, robust individuals, presumably with the proportional strength which would be required to wield some of the huge boomerang forms accurately recorded in accompanying stencils.There are numerous apparently ‘mutilated’ hands, with ‘missing’ elements ranging from joints of a single digit to several digits, at times including the thumb. Similar occurrences were recorded in the ancient stencils of underground caves in the Gargas region of the French Pyrenes.These are genuine ‘amputations’, unlike many of the deliberately folded finger forms used to create the ‘signal stencils’. Boomerang variations appear to be the only form of artefact stencilled during the IIA Period, and then only in comparatively small numbers. A frequently appearing form shows one blade apparently partly broken off at a sharp angle. There is a likelihood that such an unusual but recurring profile as the apparently heavy and ungainly ‘broken tip’ boomerang depicts a specific purpose weapon, its efficiency ensuring its continued use and reproduction. A weapon of similar profile from contemporary times is the fish-killing boomerang, known to have been used in the coastal region around Broome in the south-west Kimberley. When considering the high numbers of fish species shown in the IIA Period art, the possibility should not be discounted that the ‘broken tip’ boomerang was a specialised weapon for hunting aquatic, rather than terrestrial species, for which it appears too bulky and decidedly un-aerodynamic. Belief that boomerangs are a uniquely Australian invention is a widespread misconception. The world’s oldest boomerang was excavated in 1987 in Poland, and is a 23,000 year old specimen carved from mammoth tusk. Non-returning boomerangs were widely used in prehistoric times in areas as diverse as Holland, Germany, Denmark, Vanuatu, Indonesia, India, Alaska, Arizona and Egypt. Boomerangs were used in Egypt as early as 4000 years ago, with many well preserved examples from Tutankhamen’s tomb expanding our understanding of their diversity and form. Hand prints are commonly in concentrated groups, sometimes numbering hundreds, and at times are positioned quite high on walls. An interesting variation on hand prints is the ‘decorated positive print’. Artists first coated their hands with an ochre solution before etching a non-figurative design (mostly curvilinear forms) with a finger into the palm area paint. When the hand was pressed onto the rock, it created a typical solid Positive Print in which the ‘unpainted’ design clearly stands out in high contrast. Another theme in the print range is String Imprints, accompanied by fewer Grass Imprints, some of which even show seed head detail of the diverse species involved. Height appears to have been important in early string, grass and object print positioning, and examples are commonly found in association with high, and now inaccessible, wall and ceiling areas. Some examples are positioned more than 20 metres up the stable surfaces of overhanging shelter walls (C). There is no evidence of rock fall removing ancient means of human access. One cannot help but wonder at the circumstances surrounding the creation of the prints. The possibility of access via long vanished huge trees at shelter entrances may explain the positioning of some examples. However, the unexplained positions of sufficient examples remain to suggest the use of some form of very high and complex scaffolding. A source of suitable scaffolding material in today’s Kimberley environment is incomprehensible. If the ancient print making culture existed in a vastly different environment, then the possibilities would greatly increase. If resources such as giant bamboo or similar forms of giant grasses were present, the only limitations would be human innovation and determination. An example of indigenous people overcoming similar challenges may still be found today in Thailand, amongst the swiftlet nest-gathering people. Some prints are positioned too high for clear identification, at times more than 20 metres up stable walls of overhanging shelters. The inaccessibility of the two arrowed String Prints in this site is indicated by Grahame Walsh standing on the shelter floor. At least four recurring identifiable species of fish are found, as well as other less specific forms. The fork-tailed catfish and the eel-tailed catfish are represented most frequently. A very limited range of aquatic species is regularly depicted, with identifiable examples being freshwater species, largely associated with shelters along major water courses, suggests an association with a freshwater rather than a marine environment. Although larger-than-life sized macropods are the most striking artistic subjects, fish paintings are greater numerically. Small numbers of long-necked tortoise are also depicted. Most interesting among the fish depictions is a recurring form with a basic body similar to the long tom, but with a distinct narrowed ‘neck’ below its rounded head and long beak-like jaws. It is a consistently repeated form, without resemblance to any known species, and has been referred to as the ‘alligator head fish (A). Although easy to relegate it to the product of artistic licence, the possibility should not be overlooked that it may accurately record some now extinct aquatic species. 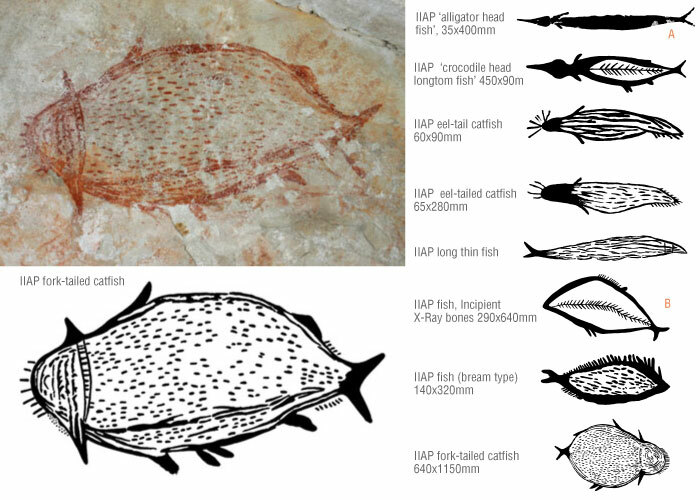 Some very interesting skeletal forms are evident in fossil records found in north-western Queensland areas around Hughenden, although any inference that the fish rock paintings represent truly archaic species is not intended. One of these species is the Belonostomus, which reputedly grew to about two metres in length. Its long, thin, finely toothed snout extended from a prominent, rounded head, similar to the species in the rock art. Fossil skeleton reconstructions show additional similarities in both body shape and fin configuration. An even earlier fossil creature of similar appearance is the Platypterygius, an air-breathing but fully aquatic icthyosaur, or ‘fish-lizard’. This species is relatively common in fossil records from the Mid Cretaceous, approximately 100 million years ago. Occasional fish motifs from the IIA Period incorporate the most basic form of X-ray detail, which appears restricted solely to spine and short rib detail (B). feet and digits in paintings. The ring-tail rock-haunting possum is a recurring marsupial element in the IIA Period art, as in this 540x280mm depiction. The short stocky tail and distinctive rear paws are always emphasised as indicators of this species. Large marsupial paintings display some of the most highly developed levels of artistic refinements of the IIA Period, with superb proportions, and fine head and hopper detail evident on larger than life specimens. At times, pairs of tracks are also associated with the depictions, creating a form of Story Panel. Interesting evidence survives on some of the larger macropod paintings to indicate the competency of the artists. Larger figures were first drafted with long sweeping lines, and secondary strokes were used to adjust contours and alignment until high levels of naturalism were achieved. This 1500x1780mm example shows extreme deliberate defacing by pounding from later cultures. Note the abandoned original draft outline of the rump section, and concentrated areas of deliberate pounded defacing. The recurring association of different styles of infill for different-sized macropods has, I believe, specific identity-key significance. Smaller macropods tend not to be shown with the ‘classic’ irregular infill forms, but feature slightly more ordered forms of longitudinal broad line infill. Based on present-day species, they appear more like wallabies or rat-kangaroos of the species we know today, rather than kangaroos. Flying possum and flying foxes depictions are uncommon. Far more detailed examples, including extremely rare depictions of animals in full flight appear to be part of the IIA Period Naturalistic Macropod Sub-Group. These flighted examples even show thumb detail on extended wing membrane. Echidna motifs are mostly shown in profile view, with a number having variations of a basic form of X-ray internal detail. These represent some of the earliest forms of Kimberley X-ray art, and on this species appear most detailed. Snakes are depicted in limited numbers. A range of large depictions of varying forms of yams and unidentified flora is present IIA Period. Within IIA Period freehand depictions, there is a definite bias towards food resources. This suggests a secular role centring around group survival and maintenance of resources. This suggested role differs greatly from all following Kimberley rock art until the most recent food and resource oriented Wanjina Period, which possibly developed in the last 500 years. The subject matter of depicted resources appears to be environmentally linked: fish have dominated site themes near major water courses, while they are noticeably absent from water-distant sites. Yams are associated with water-distant sites and are absent from major water source sites. Evidence of tuberous species as well as grass seeds may be interpreted as indicators of times of environmental stress, as their gathering and processing require such high levels of time and energy that they would logically only be resorted to during times of diminished resources. Some species of yams and taros contain acrid or toxic compounds which must be removed, involving various combinations of cutting, scraping, soaking and cooking. Timing and origins of seed-processing have been linked with periods of stress in the arid and semi-arid zones. A range of IIA Period flora depictions appears to show tubers of a similar appearance to recent Kimberley paintings identified by Aborigines as Dioscorea species. The recurring depiction of a range of tubers and yams in the apparent food-resource dominated theme of IIA Period rock art may be indicative of their early importance in the Kimberley. ‘A’ This 610x750mm IIA Period example is of the ‘star yam’ type, with tubers radiating out from a central point. Numerous Tassel and Sash Bradshaws can be seen superimposing its lower sections. ‘B’ Another example of the IIA Period yam range appearing in the most recent Wanjina Period is the ‘bomb yam’ type, as shown in this 620x250mm example. ‘C’ Another 230x120mm example of the recurring ‘heart shaped’ motif among IIA Period flora depictions. Detail of the upper leaf/flower/seed head of the extending ‘stems’ have been obscured through deterioration. ‘D’ One of the unusual IIA Period flora depictions is this 300x740mm example, appearing to show some form of yam or tuberous root with leaves intact. Most of the motifs are primarily naturalistic, although any stylisation would make the species very difficult to identify. ‘E’ Some IIA Period yam examples feature fine lines running either side of the motif’s length, as on this 980x310mm example. Similar fine multiple-line appendages are common to many ‘Early Art’ motifs of the Northern Territory West Baines River area. A definite concentration of Mulberry Hue adult hand Positive Prints, and a Mutilated Hand Stencil, are positioned around this yam. ‘F’ Occasional minor variations of the IIA Period ‘heart-shaped’ motif may include a small, circular, bulbous shape suspended below, as on this 220x170mm painting, shown among other apparent flora forms. Repetition suggests that this species was significant to the early cultures, but does not appear in identifiable form in later art. ‘G’ A more intact depiction of the recurring IIA Period ‘heart-shaped’ motif is shown in this 420x145mm painting. These usually have three vertical stalks, of which the outer two have the appearance of ‘leaves’ or ‘flowers’, and the central one a ‘stalk of buds’. ‘H’ Among the IIA Period flora depictions is a recurring form of the basic ‘heart-shape’, as shown in this 280x150mm example. These forms suggest possible short rootlets from the central base, and stalks rising above. ‘I’ Juvenile Nymphoides beaglensis tend to float as a main, heart shaped leaf with a cluster of short radiating rootlets, and trail smaller leaves on long, thin stems. When contacting muddy surfaces, the rootlets bond and the plant grows into its more recognisable waterlily form. Rootlets can face either direction, and it has been suggested that the ‘tuber’ in paintings may represent the primary leaf, while the ‘stalks of buds’ may be trailing miniature leaves. The anthropomorphs represent some of this art period’s most disappointingly produced subjects. Anthropomorphous forms are very rare in Archaic Epoch art, and are of basic and undecorated form. Male bodies are reasonably naturalistic, with digit detail clearly shown, and without gender defined. ‘B’ Smaller IIA Period anthropomorphs may show contorted forms of Feet-Facing-Opposite-Direction alignments with profile arms, such as in this 450x180mm figure. Prominent knee and elbow joints are common on smaller examples. ‘C’ This 1140x960mm IIA Period anthropomorph is one of the ‘lesser’ example with contorted alignment, and showing a featureless, plan view, round head. ‘C’ On larger IIA Period anthropomorphic figures, arms tend to hang at an angle of approximately 45˚ to the sides of the body. Figures are always empty handed, have well-defined digits and clear, heeled feet, as in this 1380x760mm example. ‘D’ Although plan views dominate IIA Period anthropomorph depictions, acceptable smaller versions of profile forms do exist, such as this 460x190mm example. Alignments tend to show a single arm and leg, both slightly bent, with knobbed joints. This shows the closest possibility to any form of ‘headdress’. Most plan view heads are round and featureless, but at times have overly prominent ears. Profile heads show basic facial detail and cranium shape, occasionally with short, erect, ‘hair’ lines, and almost invariably without hint of headdress. On larger figures, arms commonly hang approximately at a 45˚ angle to the sides of the body, and are always seen empty handed.Larger anthropomorphous figures are commonly depicted horizontally, and may reach lengths approaching three metres. The IIA Period anthropomorphs are at best modest forms, devoid of gender, where scarce female depictions are identified by small Stacked Profile Breasts on one side of their obese bodies. The obese form appears synonymous with all Archaic and Erudite Epoch depictions of females, and may provide a valuable insight into their physique in the prehistoric Kimberley. The female characteristic of localising fat deposits in the lower half of the body is termed gynoid adiposity, and is clearly documented in these early female images. The basic, undecorated forms appear to represent humans rather than deities, and a comparison of their inconsequential numbers to those of flora and fauna images suggests that rock art had a very different role in this period from that of the subsequent Erudite Epoch.